St George's Park is a mightily impressive venue. It appears on the Burton-upon-Trent horizon as you sweep up the long entrance road in and, before you know it, you are surrounded by football pitches. Do you remember the childhood butterflies in your stomach when you ran out of the dressing room and caught your first glimpse of the goal posts, knowing kick-off was a mere few minutes away? Well, stand in the centre of the 330-acre St George's Park site and look around you. Those butterflies come flooding back. The venue oozes class and professionalism and, thankfully, Harrod UK has a big part to play in that. 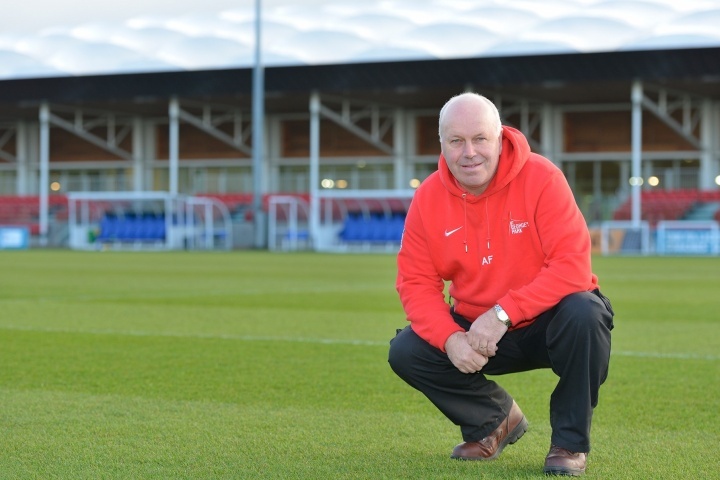 Since it opened in 2012, we have supplied football goals, nets and equipment to St George's Park, marking the continuation of our relationship with the national Football Association which includes supplying goals to Wembley Stadium. St George's Park is the national football centre for England. This means it not only hosts all of England's national football teams when they are preparing for tournaments or friendly matches, but it is also the home of coaching and development for the FA. Clubs and organisations use the facility – examples include local Football League club Burton Albion, the Great Britain Cerebral Palsy squad and the Nike Academy – while tournaments are also held at the venue for the likes of UEFA. The park boasts 12 outdoor pitches as well as a full-sized indoor pitch, an outside blind football area and three goalkeeping areas. There is a hydrotherapy suite, gym, hotel and medical and sports science facilities and the FA's Group Head of Grounds and Estates Alan Ferguson says there are plans for further expansion. Alan says that, as of spring 2016, about 120 of the 330 acres have been built on with future plans for a golf course and driving range to allow players leisure time away from the high pressure of international football. Nature walks have also been created to help the players relax. The venue is busy every day of the year thanks to the variety of clubs and organisations using it, and this means Alan and his team of some of the country's top groundsmen are kept on their toes – particularly as Alan is a stickler for keeping to the very highest of standards. He says: "My biggest challenge is to make sure we maintain our reputation and provide a quality surface for every player, whether they're here for training or whether they're playing a match. "We have to try and maintain the pitches in as tip-top condition as possible. We are in our fourth operational year and we have to try to turnover around £20million a year to keep the place going, just to wash its face. We have clubs from all walks of life coming here. "It's never quiet, it's a good busy and we enjoy it. Rain, hail, sleet or snow, we have to be here 365 days a year." Alan said: "Probably the strangest request would be the length of the grass. People think that doesn't happen but it does. We know where the guys are playing so we're usually ahead of the game and we'll try and mirror the cutting height and the amount of water they're likely to encounter."